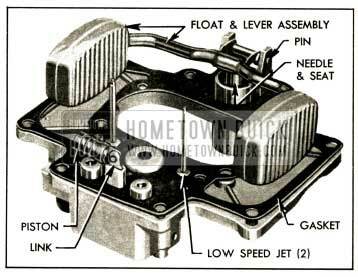 The WCD Carter carburetor used on Series 40-50 engines is a 2-barrel down draft type. It contains a float system, low speed (idle) system, high speed system, power system, accelerating system, and climatic control (automatic choke). An accelerator vacuum switch, which is part of the cranking motor control circuit, is incorporated in the body flange of 1952 Buick Carter 2-barrel Carburetor. Air enters both barrels of 1952 Buick Carter 2-barrel Carburetor through the air horn which has one inlet and contains the choker valve. Fuel is supplied to both barrels from one float chamber. The float chamber encircles both barrels and contains a dual type float and lever assembly which operates one float needle or valve. The accelerating pump jet in each barrel is supplied with fuel from one pump located in the float chamber. The power systems of both barrels are controlled by one vacuum piston and link. Except as noted above, each barrel forms a complete 1952 Buick Carter 2-barrel Carburetor system. Each barrel contains a low speed system with an adjustment screw, a high speed system with a metering rod, accelerating pump discharge jet, a triple venturi system, and a throttle valve. The throttle valves of both barrels are mounted in line on one shaft. The dual construction combines the advantages of two carburetors in one compact unit. The dual carburetor and dual intake manifold provide more uniform distribution of fuel to all cylinders than would be possible with one single barrel carburetor. 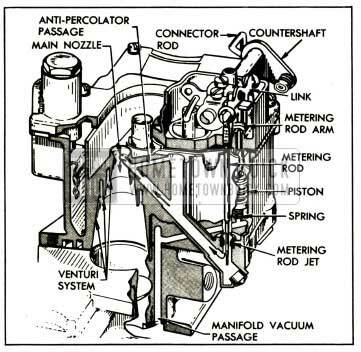 Operation of each system of the WCD Carter carburetor is described in the following sub-paragraphs. The climatic control is described in paragraph 3-19, which follows. The accelerator vacuum switch is described in paragraph 10-32. Fuel enters the 1952 Buick Carter 2-barrel Carburetor at the gasoline connection and flows through the strainer and needle seat into the float chamber. When the fuel reaches the prescribed level in float chamber, the dual float presses the needle against its seat to shut off the flow of fuel. Thereafter, the fuel is maintained at the prescribed level by opening and closing of needle as required. The float lever is hinged on a pin and connected to the float needle by a clip. The float chamber is vented externally through ports in air horn to allow fuel to be smoothly withdrawn through the various systems. See figure 3-21. Fuel is delivered to the engine through the low speed system at closed throttle and light load speeds up to approximately 20 MPH. The low speed system also partially controls fuel supply for light load speeds up to approximately 30 MPH. 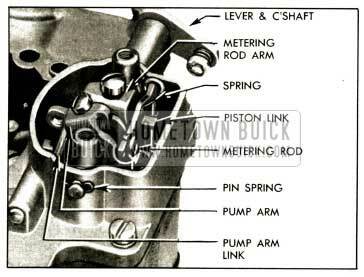 The operation of the low speed system in each barrel of the 1952 Buick Carter 2-barrel Carburetor is identical. Fuel flows from the float chamber through the metering rod jet into a passage which supplies both the low speed jet and the main nozzle. It then flows upward through the low speed jet which meters the fuel used by the low speed system. At the upper end of the low speed jet the fuel is combined with a stream of air coming in from the 1952 Buick Carter 2-barrel Carburetor throat through a by-pass. The combining of the air stream with the fuel tends to atomize or break up the gasoline into a vapor. See figure 3-22. The fuel-air mixture passes through a small drilled passage called the economizer and is combined with an additional air stream coming through the air bleed from the throat of the 1952 Buick Carter 2-barrel Carburetor. This additional air tends to break the fuel particles into a still finer vapor. The fuel-air mixture that flows downward through the idle mixture passage and out through the two idle ports is still richer than an idle mixture needs to be, but when it mixes with the air coming in past the throttle valve, it forms a combustible mixture of the right proportions for idle speed. The idle adjustment screw permits regulation of the quality of the low speed mixture. The upper idle port is slotted vertically. 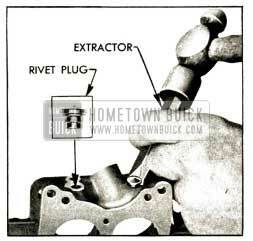 As the throttle valve is opened it not only allows more air to come in past it but also uncovers more of the idle port, thereby allowing a greater quantity of the fuel-air mixture to enter the 1952 Buick Carter 2-barrel Carburetor throat from the idle mixture passage. The closed position of the throttle valve is such that at idle speed of 8 to 10 MPH, it leaves enough of the slotted idle port in reserve to cover the range in speed between idle and the point where the high speed system begins to operate. As the speed increases from approximately 20 MPH, the low speed system starts cutting out as the high speed system cuts in until the high speed system is carrying the entire load and the low speed system is doing nothing. The high speed system controls the flow of fuel during the intermediate or part throttle operation, starting at approximately 20 MPH and continuing up to approximately 75 MPH. 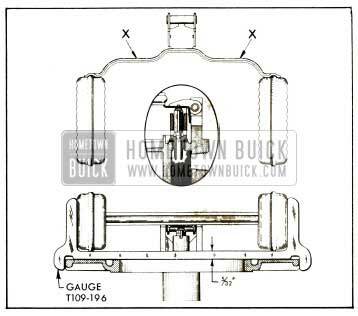 The operation of the high speed system in each barrel of the 1952 Buick Carter 2-barrel Carburetor is identical. Air entering the barrel through the air horn passes through the triple venturi system which increases the velocity of the air and creates a suction on the main nozzle. This causes fuel to flow from the float chamber through the metering rod jet into the main nozzle from which it is discharged into the air stream passing through the small venturi. The triple venturi system tends to atomize or break up the fuel into a vapor and mix it with the air stream. See figure 3-23. If any vapor bubbles are formed in the hot gasoline in the main nozzle passage, they rise in the low speed jet well and the vapor exhausts through the anti-percolator passage into the main nozzle. This avoids percolating difficulties which might occur if the vapor bubbles rose directly into the main nozzle. The amount of fuel entering the high speed system is metered or controlled by the area of the opening between the metering rod jet and the end of the metering rod which extends into the jet. The lower end of the metering rod has steps of three different diameters to provide three different metering areas, depending upon the position of the metering rod in the jet. The metering rod is connected by a link, countershaft and connector rod to the throttle shaft so that it is raised when the throttle valve is opened and lowered when the throttle valve is closed. At approximately 20 MPH the largest or economy step of metering rod extends into the jet, thereby giving the smallest possible metering area. As the throttle valve is opened for higher speed or greater power, the metering rod is raised so that the middle step and later the smallest or power step provides increased metering area between rod and jet. At top speed, the smallest or power step is in the jet. Engines operated at part throttle on level road use a mixture of maximum leanness. The mixture for greatest power and acceleration is somewhat richer, and is furnished by the power and accelerating systems described below. For maximum power or high speed operation above approximately 75 MPH, a richer mixture is required than that necessary for normal throttle opening. The richer mixture is supplied through the high speed systems of both barrels of 1952 Buick Carter 2-barrel Carburetor by means of the power system. The power system consists of a vacuum piston located in a cylinder connected to manifold vacuum, a spring which tends to push the piston upward against manifold vacuum, and a vacumeter piston link attached to the piston and supporting the two metering rods. See figure 3-23. Under part throttle operation, manifold vacuum is sufficient to hold the piston and link down against the tension of the spring, so that the link is held against the tongue of the metering rod arm. The metering rods are then raised and lowered mechanically as the throttle valve is opened and closed. When the throttle valve is opened to a point where additional fuel is required for satisfactory operation, manifold vacuum decreases sufficiently so that the piston spring moves the piston, link and metering rods upward to the proper metering rod step position to give the required richer mixture, independently of throttle opening. As soon as the demand is passed, manifold vacuum moves the piston link down against the metering rod arm so that the metering rods are controlled mechanically again. The accelerating system supplies the extra quantity of fuel which is needed momentarily for smooth and rapid acceleration when the throttle valve is suddenly opened. A pump plunger, operating in a cylinder cast into the float chamber, is mechanically operated from the throttle valve shaft by means of the throttle shaft arm, throttle connector rod, pump operating arm and countershaft assembly, pump arm and pump arm link. 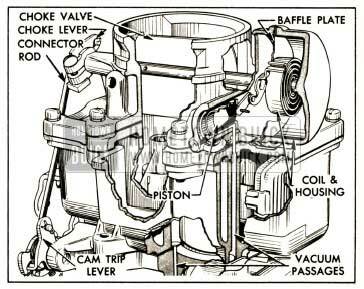 The pump circuit contains intake and discharge check valves and discharge passage leading to a pump jet in each barrel of 1952 Buick Carter 2-barrel Carburetor. See figure 3-24. When the throttle is closed, the pump plunger moves up and draws a supply of fuel from the float chamber past the intake ball into the pump cylinder. 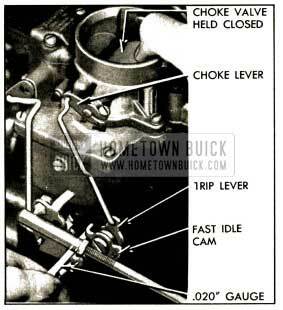 When the throttle is opened, the pump plunger on its downward stroke exerts pressure on the fuel which presses the intake ball against its seat, raises the check needle off its seat and discharges a metered quantity of fuel through the pump jets into each barrel of 1952 Buick Carter 2-barrel Carburetor. This occurs only momentarily during the accelerating period. The pump plunger spring provides a follow-up action so that the fuel discharge carries out over a brief period of time. See figure 3-24. A relief valve between the discharge passage and float chamber prevents excessive build-up of pressure in the accelerating system when the throttle is suddenly snapped open. When the desired speed is reached and the throttle is held in fixed position, the pressure on the fuel in pump cylinder decreases sufficiently so that fuel ceases to discharge from the pump jets. With the throttle held in a fixed position the fuel flows only through the low speed or high speed systems as previously described. 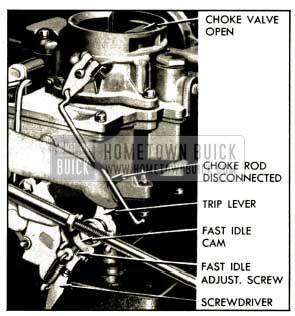 The climatic control consists of a choke valve mounted on a shaft in the 1952 Buick Carter 2-barrel Carburetor air horn, a bi-metal thermostatic coil and housing attached to a housing cast on air horn, a vacuum actuated choke piston located in a cylinder in the housing on air horn, and a fast idle connector rod which connects a lever on the choke shaft to a fast idle cam mounted on carburetor body flange. An upper heat pipe connects the choke housing to a lower heat pipe in the exhaust manifold. The choke valve is mounted off-center on the choke shaft so that the force of air stream passing through the air horn tends to move the valve to the open position. A short lever riveted to choke shaft is engaged by the free outer end of the thermostatic coil which, when cold, tends to close the choke valve. 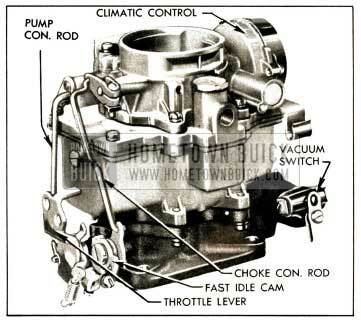 The choke piston, which is actuated by intake manifold vacuum, is connected by a link to the short lever on choke shaft and tends to open the choke valve when the engine is running. See figure 3-25. The lower heat pipe in the exhaust manifold heats the air which is drawn through it and the upper heat pipe into the thermostatic coil housing. Two slots in the choke piston cylinder permit manifold vacuum to draw this heated air through the thermostatic coil housing and down into the manifold. A baffle plate separates the thermostatic housing from the housing on air horn to insure circulation of heated air around the thermostatic coil. The fast idle cam trip lever is connected by a rod to a choke lever on the outer end of choke shaft so that the fast idle cam is rotated as the choke valve moves. In closed throttle position when choke valve is not wide open, a fast idle adjustment screw on throttle shaft lever bears against the edge of the fast idle cam to give a greater throttle opening than that provided by the throttle lever adjustment screw. The edge of the cam is graduated in height from center to give increased throttle opening as choke valve moves toward closed position. When choke valve is in wide open position, the fast idle adjustment screw is opposite an opening in edge of cam so that throttle may close against the throttle lever adjustment screw. When the engine becomes cold the thermostatic coil also becomes cold and increases its spring tension sufficiently to close the choke valve. It is prevented from closing the valve, however, because the fast idle adjustment screw holds the fast idle cam in the slow idle position; consequently, the choke valve is held partially open. When the accelerator pedal is depressed to start the engine, the fast idle adjustment screw is lifted clear of the fast idle cam and the thermostatic coil then closes the choke valve. After the engine starts running, intake manifold vacuum causes the piston to partially open the choke valve against the spring tension of thermostatic coil, thereby admitting sufficient air to give a satisfactory running mixture. When accelerator pedal is released after starting the engine, the fast idle adjustment screw comes to rest against a high point of fast idle cam which was rotated to the fast idle position by the closing of choke valve. This provides proper throttle opening to prevent stalling of the cold engine. If the throttle is partially opened while the running engine is cold, the vacuum piston and the increased force of air flow against the offset choke valve will open the valve against the spring tension of the thermostatic coil. These opposing forces balance the choke valve at a position which provides the required choke action without causing loading or an excessively rich mixture. At wide open throttle the vacuum piston does not help to open the choke valve. As the engine and exhaust manifold warm up, warm air is drawn through the heat pipes into the thermostat housing by manifold vacuum operating through the slots in choke piston cylinder. This warms the thermostatic coil, causing it to reduce its spring tension on choke valve in proportion to the increase in temperature. The choke piston moves the choke valve to a more open position within the range permitted by the fast idle cam trip lever, which can move independently of the fast idle cam which is held stationary at closed throttle by the fast idle adjustment screw. When the throttle is opened and fast idle adjustment screw is lifted from the fast idle cam, the cam then rotates to bring a lower point into position for the fast idle adjustment screw. The engine will then run at a slower speed at closed throttle. When the engine reaches normal operating temperature, the thermostatic coil is heated to the point where it no longer exerts any spring tension on the choke valve. The choke valve is in the wide open position and the fast idle cam is in the slow idle position so that the fast idle adjustment screw no longer contacts it at closed throttle. 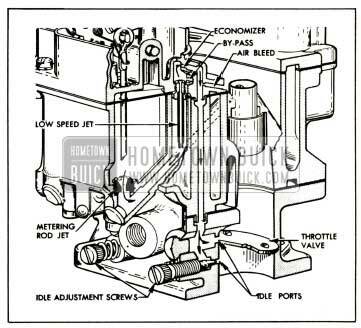 The throttle lever adjustment screw then governs throttle valve opening at closed throttle. If the engine becomes flooded for any reason, the choke valve can be partially opened by depressing accelerator pedal to the full extent of its travel. This causes a tongue or arm on the throttle lever to contact and rotate the fast idle cam, which forces the choke valve open. See figure 3-27. If the engine operates on fast idle too long after starting or else moves to slow idle too soon, or the choke unloader does not operate properly, adjust fast idle cam, choke unloader, and fast idle adjustment screw. 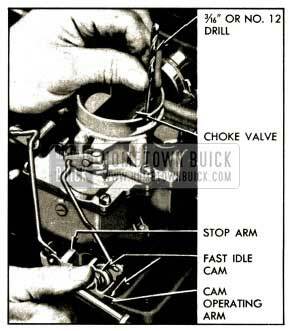 The following procedure may be used with 1952 Buick Carter 2-barrel Carburetor on engine or on the bench. Remove air cleaner and silencer, if 1952 Buick Carter 2-barrel Carburetor is on engine. Hold choke valve in closed position and see that the cam trip lever is in contact with the fast idle cam, then check the clearance between the arm of fast idle cam and the boss on body flange, using a .020″ feeler gauge (T109-29). See figure 3-26. If clearance is other than .020″, slightly loosen choke lever lock screw, hold choke valve closed and rotate choke lever on shaft to obtain specified clearance, then tighten lock screw. Recheck clearance. Open throttle until stop arm on throttle shaft lever contacts boss on body flange, then check clearance between upper edge of choke valve and wall of air horn, using a 3/16″ gauge (T109-28 or No. 12 drill). See figure 3-27. If clearance is other than 3/16″, bend the cam operating arm on throttle shaft lever as required to obtain specified clearance. 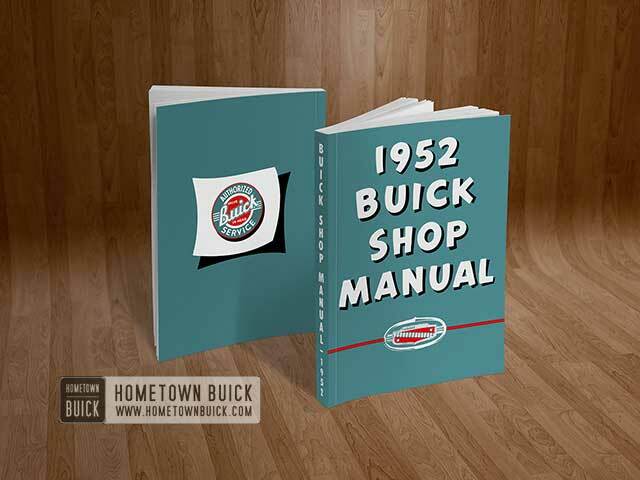 If 1952 Buick Carter 2-barrel Carburetor is installed, warm engine up to normal operating temperature and correct a tachometer to register engine speed. Disconnect fast idle connector rod from cam trip lever so that cam may be held in “cold” position while engine is running with choke valve fully open. See figure 3-28. Hold fast idle cam trip lever so that fast idle adjustment screw contacts the highest section of cam. 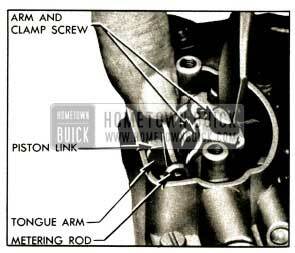 If 1952 Buick Carter 2-barrel Carburetor is on engine, turn adjustment screw to obtain engine speed of 1200 RPM. See figure 3-28. 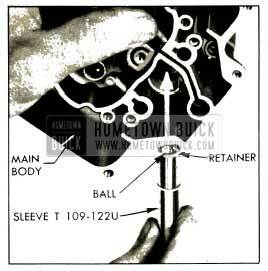 If carburetor is on bench, turn adjustment screw until a .015″ (Ser. 40-44-50) or .020″ (Ser. 70) wire gauge just can be inserted between edge of throttle valve and wall of body flange diametrically opposite the idle ports. The fast idle setting gives a throttle position equivalent to approximately 20 MPH with car on level road in direct drive and engine at operating temperature; however, when operating on cold idle the car speed will be lower than 20 MPH, depending on temperature. If carburetor is on engine, connect fast idle connector rod to cam trip lever and install pin spring, then install air cleaner and silencer. 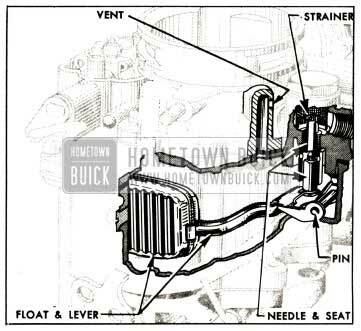 It is not necessary to remove the 1952 Buick Carter 2-barrel Carburetor assembly from the engine in order to overhaul the climatic control. Remove air cleaner and silencer, then disconnect choke upper heat pipe if 1952 Buick Carter 2-barrel Carburetor is on engine. Disconnect fast idle connector rod from fast idle cam trip lever, then remove air horn and climatic control assembly from 1952 Buick Carter 2-barrel Carburetor. Disconnect fast idle connector rod from choke lever and remove lever from choke shaft. Remove thermostatic housing and coil assembly, gasket, and baffle plate from air horn. See figure 3-29. Remove choke valve. Rotate shaft to disengage piston from its cylinder. 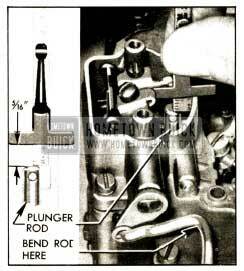 Remove choke shaft and lever assembly with piston attached. Remove piston pin and piston from link. See figure 3-29. Soak all parts, except thermostatic housing and coil assembly, in Bendix metalclene or its equivalent, then thoroughly rinse in kerosene, distillate, or white gasoline to remove all gummy deposits that have been softened by the solvent. Wipe parts dry with clean cloth. It is particularly necessary for the piston and its cylinder in air horn to be thoroughly clean and free of burrs or scores. Do not use any abrasive material for cleaning piston and cylinder. If piston or cylinder is scored replace the affected part. Check choke shaft for free action in air horn. If shaft is worn so that excessive play in bearings exists, replace the shaft assembly. If choke valve is bent or otherwise damaged it should be replaced. Inspect thermostatic coil housing for cracks and thermostatic coil for distortion or other damage. If damaged, replace the coil assembly. Check the choke suction hole in bowl cover, which may be partially clogged with carbon. Check and clean out suction hole with a No. 42 drill. Connect choke piston to shaft link with piston pin, install shaft in air horn, and guide piston into cylinder. Install choke valve on shaft with small “c” in circle on valve toward top of air horn; use new screws. Close valve and check for uniform clearance between edges of valve and wall of air horn. If clearance is not uniform, or valve sticks in air horn at any point, loosen screws and shift valve to obtain uniform clearance and freedom from sticking. It is important to have the choke valve fit properly otherwise hard starting may result. Support heads of valve screws on suitable steel block and lightly stake opposite ends of screws. Install baffle plate and a new coil housing gasket. Place housing on air horn with indicator mark near bottom and install retainers, leaving screws loose. Rotate housing counterclockwise (opposite to arrow) until choke valve closes and indicator mark is one graduation beyond large rib on air horn (1 point rich), then tighten retainer screws. See figure 3-10. Install choke lever and screw assembly on choke shaft and attach fast idle connector rod to lever. 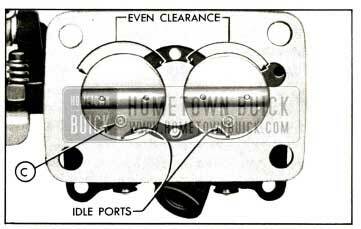 Install air horn and climatic control assembly on 1952 Buick Carter 2-barrel Carburetor, using new air horn gasket. Place gasket so that small hole aligns with choke hole in bowl cover. Connect fast idle connector rod to fast idle came trip lever with a pin spring. Adjust fast idle cam, choke unloader, and fast idle adjustment screw as described in paragraph 3-20. Connect choke upper heat pipe to choke housing then install air cleaner and silencer, if carburetor is on engine. 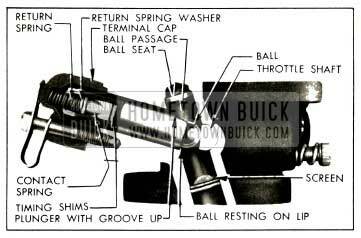 Remove air horn and climatic control assembly from 1952 Buick Carter 2-barrel Carburetor and disassemble it, following procedure given in paragraph 3-21. Remove strainer nut and gasket, and bowl strainer. Disconnect pump connector rod from pump operating lever, push retainer off lower end of rod, and remove rod and retainer. Remove dust cover. Rotate eyes of metering rods off pins on vacumeter piston link and lift rods out, using care to avoid bending them. See figure 3-30. Loosen screws in metering rod and pump arms, and remove pump arm link. Remove pin spring from end of pump operating countershaft, pull countershaft out and remove arms at the same time. See figure 3-30. Note the location of code tag and wire clip so that these can be reinstalled in their original positions, then remove bowl cover, using care to avoid damaging the float. Swing vacumeter piston 1/4 turn to remove it from piston link then remove link from bowl cover. See figure 3-31. Remove float lever pin and lift off float assembly. Remove needle from float lever. Shake float to see whether it is “loaded” with gasoline due to a leak. Remove cover gasket and carefully remove both low speed jets from bowl cover. Remove vacuum piston spring, pump plunger assembly and lower pump spring from cylinders in main body. See figure 3-32. Remove screw, jet and housing assembly, gasket, and pump check needle from main body. See figure 3-32. Remove both metering rod jets, and the pump relief plug and gasket from bottom of bowl in main body. See figure 3-32. Use a thin screw driver or a stiff wire having a short hook on one end to remove the pump intake check ball retainer. See figure 3-32. Remove body flange assembly and gasket from main body. Hold down on vacuum switch terminal cap while removing hold-down clip. Remove terminal cap and switch return spring, then lift out switch guide block with contact spring and shims. Do not lose timing shims and the spring washer on contact spring. Turn body flange over to allow plunger and ball to drop into hand. See figure 3-36. Remove throttle valves from shaft. Using rawhide mallet or equivalent, tap end of throttle shaft through the shaft retaining ring then remove shaft and lever assembly from body flange. Remove fast idle Gam and cam trip lever from body flange. 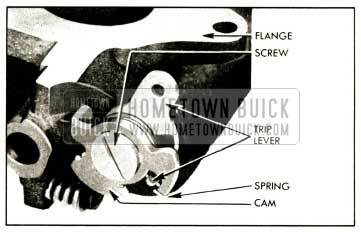 Remove idle adjustment screws and springs from body flange. Remove both idle port rivet plugs, using Rivet Extractor T109-210. See figure 3-33. Regardless of the number of new parts that are used in rebuilding a 1952 Buick Carter 2-barrel Carburetor, the job in the end will not be satisfactory unless all metal parts are thoroughly cleaned. Because of the nature of 1952 Buick Carter 2-barrel Carburetor parts, with numerous small passages subject to fouling with tenacious carbon and gum deposits, ordinary cleaning processes are entirely inadequate. The correct procedure is to use a cleaning bath in which metal parts can be immersed and “soaked” for sufficient time after disassembly to thoroughly clean all surfaces and passages. Bendix metalclene has been developed especially for cleaning carburetors, and is recommended for this purpose. Regardless of the cleaning material used, however, be sure to thoroughly rinse the parts in kerosene, distillate, or white gasoline to remove all gummy deposits that have been softened by the cleaner. Do not soak cork, plastic, or leather parts such as the vacuum switch terminal cap, switch guide block, choke thermostat and housing, and pump plunger in the cleaner. Wipe such parts with a clean cloth. Remove all carbon from barrels of the body flange so that throttle valves may close properly. Be sure to clean all carbon out of idle ports. Climatic Control. Inspect control parts as described in paragraph 3-21. Bowl Cover. Check for warped surfaces with a straight edge. Make sure that idle channels are clean and clear. If bowl strainer is damaged, or clogged so that it cannot be cleaned, it should be replaced. Float Needle and Seat. Because of the wear that normally occurs in these parts and the necessity of having a tight seating needle, it is advisable to replace these parts if the 1952 Buick Carter 2-barrel Carburetor has been used for considerable mileage. Even if mileage is low, replace these parts if needle is grooved or seat is damaged. Remove seat with a large screw driver but do not install new seat at this time. Low Speed Jets. Test jets by blowing or sucking to make sure that metering holes are clear. Inspect small ends for damage which might deform the metering holes. Metering Rods, Jets, and Spring. Metering rods and jets are subject to wear in normal use. As the parts wear, the metering orifice becomes larger and a richer mixture results. 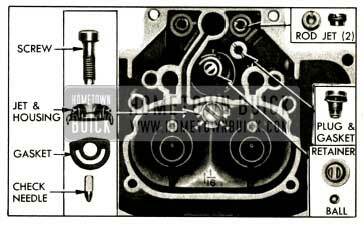 If 1952 Buick Carter 2-barrel Carburetor has been used for considerable mileage, it is advisable to replace these parts since wear cannot readily be detected by inspection. If metering rod spring in vacumeter piston link is distorted or damaged it should be replaced since it performs an important function in keeping wear of metering rods and jets at a minimum. Vacumeter Piston. Inspect vacumeter piston and the cylinder in main body for scoring or roughness. Piston and cylinder must be clean and smooth. If piston spring is distorted it should be replaced. Accelerating Pump Parts. Inspect countershaft assembly for wear of shaft and make sure that lever is tight on countershaft. Inspect throttle connector rod and holes in throttle shaft arm and pump operating lever for excessive wear. Inspect pump plunger leather washer for cracks, creases, turned edges, or other damage. Check holes in plunger shaft and pump arm, also pump arm link, for excessive wear. Inspect pump intake ball for corrosion and the retainer for distortion. The pump relief plug contains a spring loaded check ball which should seat when blowing into plug from the head end; replace this part if it is doubtful. Inspect pump check needle and replace it if tapered end is grooved or scored. Make sure that needle seat in main body is clean. Blow through each pump jet to make sure it is clean. Main Body. If passages in main body appear to be clogged with carbon and gum to such an extent that penetration of cleaning solution is doubtful, remove both nozzle passage rivet plugs using Rivet Extractor T109-210 (shown in fig. 3-33). Do not attempt to remove nozzles from main body under any circumstance. After passages are thoroughly cleaned drive new rivet plugs securely into body openings, using care to avoid distortion of plugs or openings. Body Flange Parts. Be sure that the idle discharge ports are clean of all carbon deposits and that the seats for idle adjustment screws are not damaged. If ends of adjustment screws are grooved or bent they should be replaced. Make sure that the 1/16″ holes drilled through the rear wall of body flange into each barrel are clear. These holes permit vapors to escape rather than rising into the air cleaner when engine is stopped. Check wear of throttle shaft bearing and throttle shaft. There should not be more than about .005″ play between shaft and bearings, otherwise air leaks will interfere with performance. Make sure that throttle valves are not bent and do not have burrs or sharp edges. Accelerator Vacuum Switch. Inspect ball, plunger, and cylinder in body flange to make sure all are clean and smooth. Check terminal cap for cracks. Switch contact surfaces must be smooth and free of corrosion. If strainer is damaged or is clogged so that it cannot be cleaned it should be replaced. 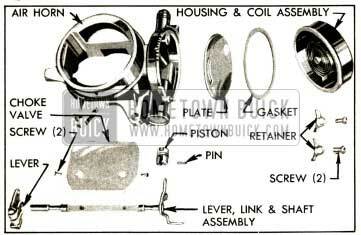 During assembly of 1952 Buick Carter 2-barrel Carburetor, use all new gaskets and any additional new parts found to be necessary during inspection. Calibrated parts must be as specified for carburetor CODE number. The following new gaskets must be soaked in 90 proof denatured alcohol for 15 minutes, installed on part, and let dry before installing the parts: Needle seat gasket; Bowl strainer nut gasket; Pump relief plug gasket. Drive new idle port rivet plugs firmly into openings in body flange, using care to avoid marring or distorting these parts. Place fast idle cam and cam trip lever over fast idle screw so that tongue on trip lever is held in the notch in cam by the hooked end of cam spring, then install parts on body flange. See figure 3-34. Slide throttle shaft into body flange with lever at closed throttle position. Place shaft retaining ring over end of shaft with prongs points outward, and push ring inward far enough to obtain snug fit against body flange without end play in shaft. Install both throttle valves on shaft, using new screws. The small “c” in circle on valves must be toward idle ports and toward lower or manifold side of body flange. See figure 3-35. Back off throttle lever adjustment screw, fully close and center both valves in barrels of body flange, then hold valves firmly while tightening screws. Hold body flange toward a light while slightly opening and closing valves to make certain they are centered in barrels. See figure 3-35. Support valve screw heads on suitable steel block and lightly stake opposite ends of screws. Install springs and idle adjustment screws in body flange. Seat screws lightly with fingers, then turn each screw out exactly one full turn off seat. Do not force a screw against its seat; this will score the point of screw and ruin it for service. Make sure that vacuum switch contact spring is assembled in guide block with the original number of timing shims and that return spring washer is on contact spring. Place switch ball in body flange. Place guide block in switch plunger and install in body flange with grooved side of plunger upward toward main body flange. Install switch return spring and terminal cap, holding cap down while installing hold-down clip and screw. See figure 3-36. Place a new intake check ball retainer and check ball in small end of the sleeve of Loader Unit T109-122U, holding sleeve vertical. Invert main body and insert parts and tool into pump cylinder, then turn body over and tap sleeve to seat the retainer in recess at bottom of pump cylinder. See figure 3-37. Install body flange on main body, using new gasket and providing attaching screws with lockwashers. Install pump relief plug and gasket in bowl of main body and install both metering rod jets. Jets must be tightened firmly but not so tightly as to cause distortion. See figure 3-32. 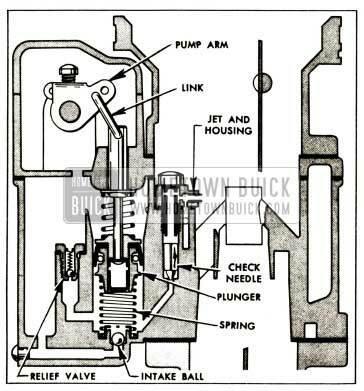 Place pump check needle, tapered end downward, in passage in main body, then install gasket, pump jet and housing assembly, and attaching screw. See figure 3-32. Place vacuum piston spring and lower pump spring in proper cylinders in main body. Install pump plunger in cylinder, using care to avoid creasing or curling edges of plunger leather washer. If old float needle seat was removed, install new seat and gasket. Using large screw driver tighten seat firmly but not so tightly as to cause distortion. Attach float needle to float lever and install float assembly and lever pin in bowl cover, leaving cover gasket off. With bowl cover inverted and gasket removed, place Float Gauge T109-196 directly under both floats as shown in figure 3-38. With float assembly resting on seated needle, adjust both floats so that the outer sides just touch the vertical arms of gauge and bottom seams just clear the horizontal bar of gauge. Make adjustments by bending float lever with pliers applied at points “X,” figure 3-38. Do not use pressure on floats. After completing float adjustments, carefully remove float assembly, install both low speed jets and a new bowl cover gasket and reinstall float assembly. See figure 3-31. Install vacumeter piston link in bowl cover with lip at center opening pointing toward outer side of cover. Use care to avoid distorting the metering rod spring or getting it out of position in link. Install piston on lower end of link. Carefully install bowl cover assembly on main body, guiding vacumeter piston into its cylinder and pump plunger rod through hole in cover. Use care to avoid pressure against float which would change its adjustment. When installing bowl cover screws and lock washers attach the code tag and wire clips in their original locations. Coat pump operating countershaft with light graphite grease and start it into bearing in bowl cover. While holding metering rod arm so that it engages opening in vacumeter piston link and pump arm so that it extends over pump plunger rod, push countershaft through both arms, then install pin spring in groove in end of countershaft. See figure 3-30. Center pump arm over pump plunger rod and tighten lock screw. Install pump arm link in plunger rod and inner hole (short stroke) of pump arm, with ends of link pointing toward countershaft arm, then install pin spring. Place pump connector rod retainer over throttle shaft lever at connector rod hole, insert end of rod through retainer and lever holes, and snap retainer into place on rod. Connect upper end of rod to pump operating countershaft arm, using flat washer on outer side of arm with spring and retainer on inner side. See figure 3-39. Adjust Accelerating Pump Plunger. 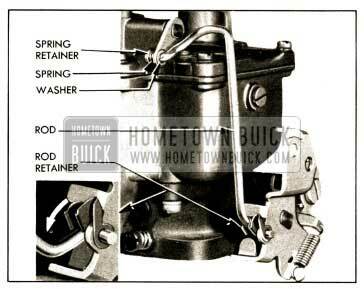 Since the pump plunger travel controls the amount of fuel discharged through the pump jets, correct plunger adjustment is very important and should be checked each time the 1952 Buick Carter 2-barrel Carburetor is assembled. Back out throttle lever stop screw, turn fast idle cam to “hot” position and full close throttle valves. Measure distance that upper end of pump plunger rod is below the edge of dust cover boss or bowl cover, using a narrow scale with sliding depth clip as shown in figure 3-40. This measurement also may be taken with Pump Stroke Gauge T109-117S, if available. The correct distance from upper end of plunger to edge of dust cover boss is 5/16″. If Gauge T109-117S is used, a reading of “33” should be obtained when gauge finger just touches upper end of plunger rod. If position of plunger rod is not as specified, bend throttle connector rod at upper angle to obtain specified measurement. Insert end of each metering rod in hooked end of metering rod spring, carefully push rod down to enter metering rod jet, then rotate eye of rod over pin on vacumeter piston link. Use care to avoid bending metering rod. See figure 3-30. Adjust Metering Rods. Proper setting of the metering rods is of vital importance to engine performance and fuel economy; therefore, the following adjustments must be carefully made after adjusting the pump plunger (step 21). Back out throttle lever stop screw to allow throttle valves to seat in bores of 1952 Buick Carter 2-barrel Carburetor, and loosen metering rod arm clamp screw. Press down on vacumeter piston link until metering rods bottom in 1952 Buick Carter 2-barrel Carburetor body casting. While holding rods down and throttle valves closed, revolve metering rod arm until tongue on arm contacts lip of vacumeter piston link, then carefully tighten metering rod arm clamp screw. See figure 3-41. Pack dust cover screw holes in bowl cover with light graphite grease and install dust cover. Install bowl strainer and strainer nut with new gasket. Assemble and install air horn and climatic control assembly, following procedure given in paragraph 3-21. Adjust fast idle cam and choke unloader as described in paragraph 3-20. Check the timing of accelerator vacuum switch as described in paragraph 10-32, using a 6-volt battery and test light.